The biggest challenge for some vegetarians to take the final step towards veganism is the addiction to cheese and for those that love indian food the thought of giving up paneer is terrifying. I thought that I’d veganize this popular indian dish and see if it could convince some of the die-hard paneer junkies. My first attempt at this was for Vegan Mofo last year. It turned out pretty well and I think this may turn out to be a favourite for some of you out there. 1. Brown the cashews lightly in a dry frying pan, then chop coarsely and then set aside. 2. Sautee onions in oil, add cinnamon, cardamom, bay leaf and the black cumin seeds and fry till fragrant. 4. Sprinkle in the chilli, coriander, cumin and turmeric powders and mix well. 6. Add coconut milk and cook over low heat. 7. Once the gravy has thickened considerably, add the salt and remove from heat. 8. Garnish with sliced green chilies and cilantro. You may throw in some slivered almonds for added effect. Serve on a bed of steamed basmati rice. If you like a little more “heat” then add some ground fresh green chillies shortly after adding the coconut milk. I added 5 or 6 and it added the extra bite to the dish. 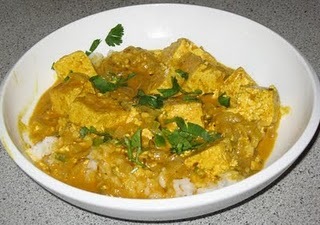 3 Responses to "Tofu “Paneer” Korma"
I make something very similar and tofu paneer always rocks! next time I’m making your recipe – you seem to be a gal who knows a thing or two about Indian food.